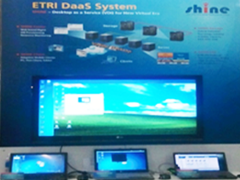 Technology: An Immersive Telepresence Platform based on Distributed Architecture. 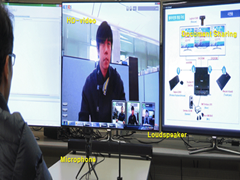 An Immersive Telepresence Platform is used to reduce traffic overload. Its real-time packet loss recovery allows users to communicate over video with high quality image and audio. Technology: Virtual Desktop Cloud Platform for business cloud service. The cloud Desktop as a service provides desktop virtualization which allows users to utilize the personal desktop remotely over the Internet. 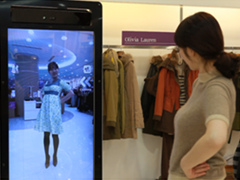 Technology: Virtual fitting room and body scanning. Image sensor is used to measure body size and generate user-avatar automatically so that it implements real time cloth simulation based on the user’s movement. Technology: Long distance eye ball tracking Technology. This technology is used to control devices from 2m distance by using eye ball tracking technology instead of using a mouse and remote control. Manufacturing management system, the name F-OPIS(Factory-Online Production Innovation System) is synonymous with vertical integration between manufacturing and management levels. Interfaces with ASSESS(Assessment Tool), SIM(Process Simulator), SMART(Bottleneck Manager, Scenario Analyzer, Optimization Selector, Advanced Planning Scheduling) and MES(Manufacturing Execution System) are an integral part of this solution. 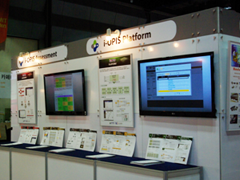 As an integrated, modular platform for production, resources, decision making, process and quality management, F-OPIS provides a smooth flow on informations. It also performs important functions in the areas of recording, evaluation and planning-making information available to line managers and production schedulers at the push of a button. 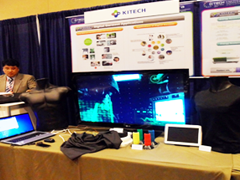 Digital clothing is used to analyze biological signals and prevent diseases in advance. Health care system by using digital clothing. WMSS(Wellness Mentor Supporting System) allows wellness mentor to analyze customer's personal wellness record and derive appropriate health-related consulting contents by using Case-Based Reasoning(CBR) algorithm. CBR means using old experiences to understand and solve new problems. In CBR, a reasoner remembers a previous situation similar to the current one and uses that to solve the new problem. CBR can mean adapting old solutions to meet new demands; using old cases to explain new situations; using old cases to critique new solutions; or reasoning from precedents to interpret a new situation or create an equitable solution to a new problem.